The key to breeding heat- and drought-tolerant rice, maize and wheat may lie in the ‘waxy biosynthesis’ genes of a related cereal, the pearl millet, according to a study by an international team of scientists. 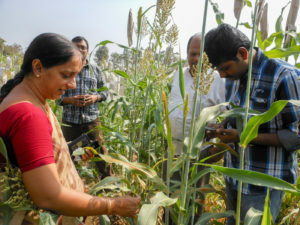 In a study published in September in Nature Biotechnology, the scientists show the potential use of genome sequencing and resequencing information for the hybrid breeding programmes of pearl millet and other cereal staples in South Asia that could be critical in the development of cereal crops adapted to a warmer future. Pearl millet is grown on about 27 million hectares worldwide and nourishes over 90 million people in arid and semi-arid regions of Sub-Saharan Africa and South Asia. It is included in the same family to which major cereal crops of the world such as maize, rice, wheat and barley belong. Nutrition studies show that pearl millet has the potential to fight iron deficiency, a widespread micronutrient deficiency and a major cause of anaemia, affecting the health and development of a third of the global population. The team has identified the genes that confer on pearl millet the ability to withstand temperatures of up to 42 degrees Celsius as well as drought conditions. Most cereals cannot tolerate temperatures over 30—35 degrees Celsius, as grain formation begins. 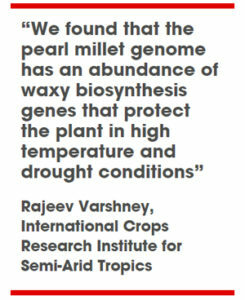 “We found that the pearl millet genome has an abundance of waxy biosynthesis genes that protect the plant in high temperature and drought conditions,” says Rajeev Varshney, research director at the International Crops Research Institute for Semi-Arid Tropics (ICRISAT), India, and coordinator of the Pearl Millet Genome Sequencing Consortium. The research led by ICRISAT, BGI-Shenzhen (China), and the French National Institute for Sustainable Development, involved a team of 65 scientists in 30 institutes using the advanced DNA sequencing to identify valuable traits like drought and heat tolerance, pest resistance and nutrition. Importantly, the team resequenced and analysed 994 pearl millet lines, enabling insights into population structure, genetic diversity and domestication. The resequencing data was then used to establish marker trait associations for genomic selection and to define heterotic pools. A heterotic pool is a group of related or unrelated genotypes displaying similar combining ability when crossed with genotypes from other genetically distinct germplasm groups. Heterotic groups are important for hybrid breeding. “This crop is well adapted for warming environments,” says Swapan Datta, a crop scientist currently serving as pro-vice-chancellor, Visva Bharati University, Santiniketan. “Unfolding the genes that encode important traits for nutrition and abiotic stress may be combined with genome editing to design better crop varieties,” says Datta, formerly deputy director-general, Indian Council of Agricultural Research. Researchers from the International Crops Research Institute for the Semi-Arid Tropics (ICRISAT) and partners successfully developed aflatoxin-free peanuts. The open-access article about the study is published in the Plant Biotechnology Journal. According to the research article, they have achieved a high level of aflatoxin resistance in peanut by over expressing antifungal plant defensins MsDef1 and MtDef4.2, and through silencing of aflM and aflP genes from the aflatoxin biosynthetic pathway. The overexpression of genes improved the genetic resistance to Aspergillus flavus infection, while the gene silencing inhibited aflatoxin production during infection. This provides durable resistance against different Aspergillus flavus morphotypes and negligible aflatoxin content in several peanut events/lines as well. This revolutionary approach has the potential to significantly reduce aflatoxin contamination not just in groundnut but may also be applied to other important crops such as maize, cottonseed, chilli, almond, and pistachio. For more details, read the news release from ICRISAT and the research article in Plant Biotechnology Journal. Souvent assimilées à une alimentation traditionnelle et parfois démodée, les céréales comme le mil et le sorgho ont longtemps souffert d’impopularité dans le système alimentaire. Pourtant ces grains sont dotés d’immenses potentiels qu’ils n’attendent qu’à dévoiler, mais surtout, ils constituent une solution aux problèmes majeurs auxquelles fait face la planète: pauvreté rurale, malnutrition, changement climatique et dégradation de l’environnement. C’est le cas du mil, du sorgho, et des légumineuses à grains telle que l’arachide. Ils sont bons pour le producteur pour différentes raisons dont le rôle important qu’ils jouent dans la fertilisation des sols; les légumineuses alternées avec d’autres cultures, augmentent l’efficacité d’utilisation d’eau pendant toute la rotation des cultures. De plus contrairement à d’autres cultures, elles n’ont pas encore atteint leur limite de rendement et possèdent encore un grand potentiel pour accroître la productivité. Enfin ils sont bons pour la planète car ces cultures survivent mieux aux environnements difficiles dans les zones arides. En période de sécheresse, le mil et le sorgho sont pratiquement les seules cultures viables. Durant toute la campagne retrouver les recettes à base de mil, sorgho, arachide ou encore de moringa que j’ai concoctées pour vous. Amoureuse des produits locaux, imaginez la fierté d’un tel partenariat. Depuis 45 ans, ICRISAT œuvre dans les zones arides pour l’amélioration des céréales et les légumineuses à grains et ainsi lutter contre la pauvreté, la faim, la malnutrition et la dégradation de l’environnement. J’ai rejoint le mouvement et vous? Savez-vous que d’après l’ONU, pour pouvoir nourrir les 9 milliards d’habitants que comptera la planète d’ici 2050, la production alimentaire mondiale doit augmenter de 50 %. Il est dés lors indispensable de gérer autrement nos ressources naturelles et de cultiver différemment pour garantir la sécurité alimentaire à tous, et en particulier aux populations les plus pauvres. La FAO (organisation des Nations unies pour l’alimentation et l’agriculture) parle de nécessité d’une alimentation durable. The occasion was not only a platform to discover novel recipes, it also provided the opportunity to learn about the health benefits of groundnuts and groundnut based products. It was put together by the Feed the Future Nigeria Livelihood Project, International Crops Research Institute for Semi-Arid Tropics (ICRISAT) and the Catholic Relief Services (CRS). The unique exhibition had a mélange of food, drinks and snacks in which groundnut was used as a primary ingredient. It was a showcase of the very best of home-cooked fare. On display were groundnut vegetable soup, groundnut pap, groundnut paste/butter, groundnut bread, groundnut cake, groundnut cookies, groundnut doughnut, groundnut-rice pap, roasted groundnut, boiled groundnut among others. It was a free cuisine tasting event and participants who were rapt by the assorted foods put on show, indulged themselves in the groundnut banquet. “It was such a striking showing of array of groundnut based products, indicative of the resourcefulness of the brains behind them,” Malama Aisha, one of the attendees said. Some others present at the event variously described the groundnut regimes as enticing, tasty, delectable, appetizing and scrumptious, among other mouth-watering adjectives. Among the points underscored at the mega demonstration were that groundnut and groundnut-based snacks provide healthier alternatives to empty calories and fatty snacks due to their nutritional contents. It was also noted that groundnut cereal pap is ideal as complementary feeding for babies six to 12 months and adult members of the family notably the elderly as it contains high levels of vitamin A. Participants were not only treated to a wide-range of groundnut diets to relish, they were presented with copies of a nutrition guide which is noted to be full of ideas for a healthier life style. The ‘Cook’s Guide for Smart Groundnut and Groundnut-based Products for Improved Nutrition in Nigeria’ was launched at the occasion. Contributors to the development of the book included representatives of International Crops Research Institute for Semi-Arid Tropics (ICRISAT), Institute for Agricultural Research, Ahmadu Bello University (IAR/ABU), Women Farmers Advancement Network (WOFAN), Catholic Relief Services (CRS) and e-Health Africa. “Groundnut plays a vital nutritional role in the diet of many Africans since it has high protein content and healthy fats. Groundnut has all the benefits of a perfect fruit – it competes with fruits in its contribution to our diet and health. “Groundnut provides five essential nutrients: energy, protein, phosphorous, thiamine and niacin,” they pointed out in the smart groundnut grub guide. According to them, the health benefits of groundnuts align well with the different ways it can be consumed, adding that it contributes to the recommended levels of food requirements to the body. “However, the small size of nuts can be misleading, but collectively, they provide fat for our hearts thereby reducing the risks of heart-related diseases; protein required for replacement and/or repair of the cells of our bodies; antioxidants that protect our hearts and decrease invasion by diseases; minerals needed by our bodies to function and minimize the risks of heart deficient diseases; vitamins required by our body cells and development of tissues,” the contributors said. They however cautioned that groundnut is susceptible to mold and fungal invasions as well as their attendant health risks. “The main concern is aflatoxin, a poison produced by a fungus called Aspergillus flavus which can be very toxic; causing new growths that are found in the skin or the lining body organ. 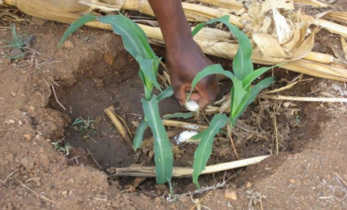 “Best practices such as improved farm management, storage and processing technique are known to reduce (or even) eliminate the risk of aflatoxin contamination,” they stated. Feed the Future Nigeria Livelihood Project’s Ag. COP, Dr Azeez Oseni, said the event was part of efforts to raise awareness and demonstrate the nutritional and health benefits of consuming aflatoxin-free groundnuts. Country Project Manager, Nigeria USAID Groundnut Up-scaling Project, Michael Boboh Vabi, said it was aimed at enhancing awareness and knowledge about the importance of consuming groundnuts and groundnut based products. He urged project partners to make use of the nutrition guide in their interactions with community-based groups and schools for preparing the different recipes. In a study published in Nature Biotechnology, a team of scientists including from International Crops Research Institute for Semi-Arid Tropics (ICRISAT), India, and Institut de Recherche pour le Développement (IRD), France, detail how the pearl millet (bajra in Hindi) can survive scorching heat. 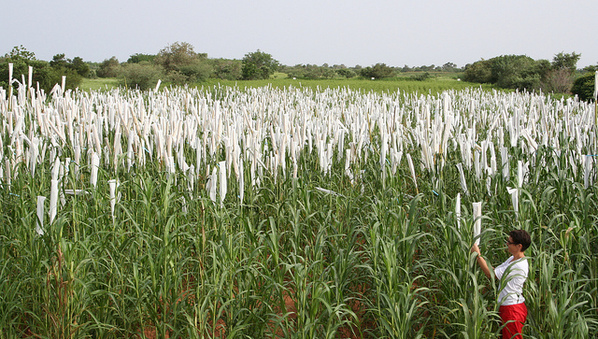 The international team decoded the genome of the pearl millet variety (Cenchrus americanus (L.) Morrone) that grows in semi-arid climates, thanks to its ability to survive temperatures up to 42 degrees Celsius. This cereal has great nutritious value and provides essential nutrients, including iron. Using latest technologies in DNA sequencing, the scientists identified key molecular markers relative to drought, heat, or pests resistance. Their results pave the way for renewed research on this variety that could increase yields and provide instrumental in improving food security for people living in semi-arid regions of Asia and Africa. Read more on the website of ICRISAT here. In eastern Kenya, the dry season is getting longer. With less rain, three out of four maize harvests fail. Researchers have identified sorghum as a more suitable crop for the changing climate. Now they have to convince farmers to make the switch. “I was struggling to provide a livelihood for my family. But now I harvest more sorghum and finger millet for food and sell the excess to the market. From the sales proceeds, I get enough money to pay school fees for my two children. I have also built a modern house, bought a motorcycle, 12 cattle (among them 8 bulls) and started poultry keeping from the money I gained from selling sorghum and finger millet grain and value-added products (cakes and mandazi).” Juliana Gunzu. Juliana Gunzu is one of 40,000 farmers who have benefited from the introduction of improved sorghum varieties and training on how to manage the crop in the field, how to handle the crop during and after harvesting and on agribusiness. Juliana comes from Iramba district in central Tanzania, which experiences low rainfall and short rainy seasons that are often erratic, with widespread drought in one year out of four. 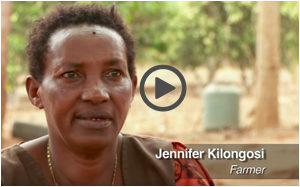 5 years ago, Juliana was a poor farmer who produced very little from her farm. Today, she is what they call a QDS (Quality Declared Seed) farmer. Quality declared seed is a class of seeds which are produced by farmers at farmer/village level while following government rules and regulations and are sold in the community. She is also a lead farmer who offers extension services to other fellow farmers using the farmer field school approach. She attributes her success to her involvement in the recently concluded IFAD project – Sorghum for Multiple Uses (SMU). SMU began its operations in January 2011 and has just concluded in September 2017. The project has been very effective in improving food and nutritional security and incomes of the smallholder farmers in Kenya and Tanzania which were the countries of focus for this project. Improved varieties of sorghum (Macia and Kari Mtama 1), finger millet (U15 and P224) and pearl millet (ICMV 221) were distributed to farmers through seed minipacks. 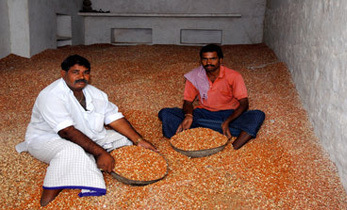 These farmers were then trained on how to produce clean seed. In Kenya, the project used the informal seed delivery systems, while in Tanzania, they used QDS system to ensure supply of seed in the communities. This proved to be very successful. In 2016 and 2017, for example, farmers in Western Kenya produced 110 tons of sorghum and finger millet seed from the 28 tons of foundation seed multiplied at the research stations. In addition to working to improve access to better seeds and increasing productivity, the project team worked to enhance utilization and commercialization of sorghum. The project purchased threshers which were used to ease the labor burden from especially women and children usually involved in the threshing, in addition to improving the grain quality which enabled the farmers to fetch higher prices. The project also purchased charcoal ovens which were used to train over 70 farmer groups on value addition of sorghum. Other farmers were trained on poultry feed formulations and on the utilization of sorghum stovers for livestock. Thus, there has been a spike in the demand and utilization of sorghum in these communities. Aspects of collective marketing were introduced and very well embraced by the farmers. Over 150 marketing groups were formed and their members trained on grain production, post-harvest handling and agribusiness. Being part of marketing groups has helped to assure farmers of fair prices for their produce, on one hand and on the other, assuring buyers of high quality grain. Marketing groups tend to have stronger bargaining positions and have set up systems to maintain minimum quality requirements. This has been very fruitful particularly in Tharaka Nithi county in Kenya where over 1500 tons of sorghum worth Kshs. 54 Million ($540,000) was sold to the East Africa Malting Limited (EAML) in 2016. Successes in this program has led to the birth of a new five-year program called SOMNI (Strengthening Sorghum and Millet Value Chains for Food, Nutritional and Income Security in Arid and Semi-Arid Lands of Kenya and Tanzania), which is designed to build on the successes of SMU. “SOMNI will be working to promote sorghum, finger & pearl millet, pigeonpea and cowpeas. Combining smart cereals and legumes will achieve a triple win – improved nutrition, incomes and climate adaptability”, said project team leader, Dr. Henry Ojulong. “We need to further improve the utilization of these foods for better food and nutrition security”, he added. Dr. Eric Manyasa, Sorghum Breeder at ICRISAT points out that SOMNI will build on successes of SMU and HOPE 1 which include, among others, the release of 11 sorghum varieties (6 Open Pollinated Varieties -OPVs and 5 hybrids) in Kenya and 2 sorghum OPVs in Tanzania. These varieties, he said, offer farmers a variety of choice based on what suits their agro-ecologies and end-use. SOMNI will be up and out scaling these technologies. SOMNI brings together a variety of partners including researchers, agriculture and nutrition extension personnel from the national programs, NGOs, private seed companies, food and feed products processors, among others. “We and not I is a core message for this project. ICRISAT cannot work alone and partnerships of the NGOs, government agencies and the private sector are vital to reach our farmers in the arid areas”, said Dr. Esther Njuguna, an ICRISAT scientist specializing in gender integration. The new project which covers Kenya and Tanzania seeks to improve the livelihoods of at least 30,000 resource constrained farmers and will have a special focus on the youth, women and the disadvantaged members of the farming communities. 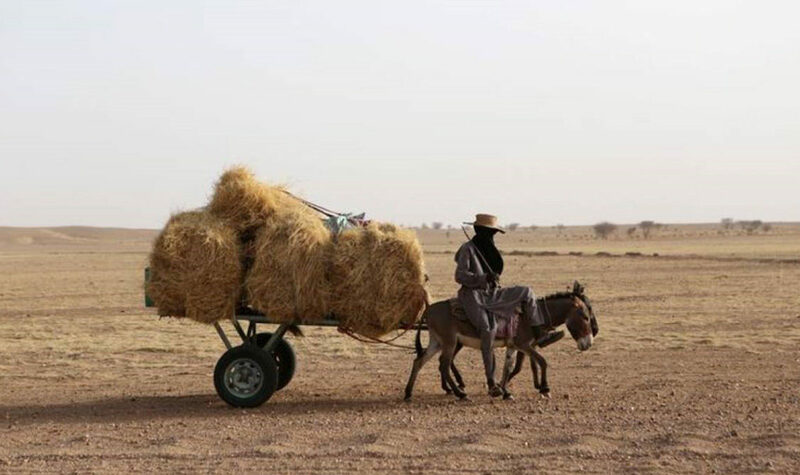 A farmer rides a donkey cart with hay on the back outside Agadez, Niger. Most Nigeriens depend on farming but widespread soil degradation and climate variability make it difficult to sustain a family all year long. Every year, unwanted migration of millions of people fleeing hunger, poverty and conflict is transforming the international development agenda for the years to come. 244 million people, about half of whom are women, decided to migrate in 2015, hoping for a better future for their children. With climate change and widespread land degradation, environmental migration is on the rise. This is particularly true for Niger a country of the Sahel region used to men migrating to neighboring countries from January to April after the harvests, searching for casual labour, during what they call the Exode. Niger is also fast becoming a migration hub towards North Africa and Europe. While 8 out of ten Nigeriens depend on farming in this country, widespread soil degradation and climate variability make it difficult to sustain a family all year long. Niger experiences drought at least once every two years. Only one percent of the country’s land receives more than 600 mm of rain each year, and just 12 percent of land can sustain agriculture. There is an ongoing food and nutrition crisis across the Sahel and Nigeriens, especially women and their children, suffer as they have less access to productive land to produce food. For this year’s World Food Day, the FAO calls to change the future of migration by investing in agriculture and food security, especially in the drylands, so that rural families can make a decent living from their farm for them and the next generation. In 2013, the government of Niger launched the ambitious 3N initiative (Nigeriens Nourishing Nigeriens) to tackle this food security through “agricultural and political transformation”. More inclusive land access, as requested by the upcoming Conference on Land Policy in Africa next November, would be a good step forward. This is an urgent need for Nigerien women who have much limited access to agricultural land and farm assets, despite their central role for family nutrition. More than half of Sahel lands are degraded. Nigeriens are among the poorest, but also the fastest growing population with 4% annual growth rate. Pressure on agricultural lands means farmers cultivate fragile and marginal lands. Unsustainable grazing and farming practices like the clearing of tree cover to plant staple food crops of millet and sorghum, and removal of crop residues to feed animals without alternatives to renew soil fertility have accelerated this land degradation. A hard red watertight lateritic layer prevents water seeping into the soil and plants to grow. Rural communities have abandoned these degraded common lands to free-range grazing animals and firewood harvesting, as not much grain can be produced there. However, because these soils are rich in clay, they can retain water much better than the sandy soils. And could be a precious food resource during the rainy season if the compacted layer is broken. This is the rationale of the Bio-reclamation of Degraded Lands (BDL) system. BDL combines indigenous water-harvesting techniques, application of organic matter and plantation of high-value trees and vegetables. 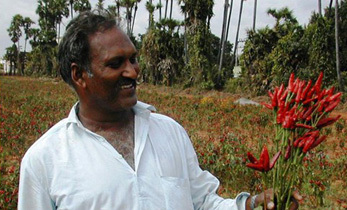 The idea is to restore productivity of the barren lateritic soils by using traditional water-harvesting planting techniques, like half-moons or zai pits, for the cultivation of high value vegetables and trees, instead of millets or sorghum as farmers used to do. The impact on incomes and family nutrition makes the intensive labor investment worthwhile. Over 10,770 women have been trained in BDL, planting nutritious vegetables like okras, sorrel or protein-rich leafy vegetable Senna obtusifolia, together with drought tolerant trees like vitamin C rich Pomme de Sahel (Ziziphus mauritiana), moringa, sweet tamarind, marula or Australian acacia depending on the families’ needs. In addition to supplementary food, trees can also provide firewood or fodder, shade and live fencing to protect the farming plots against errant livestock. 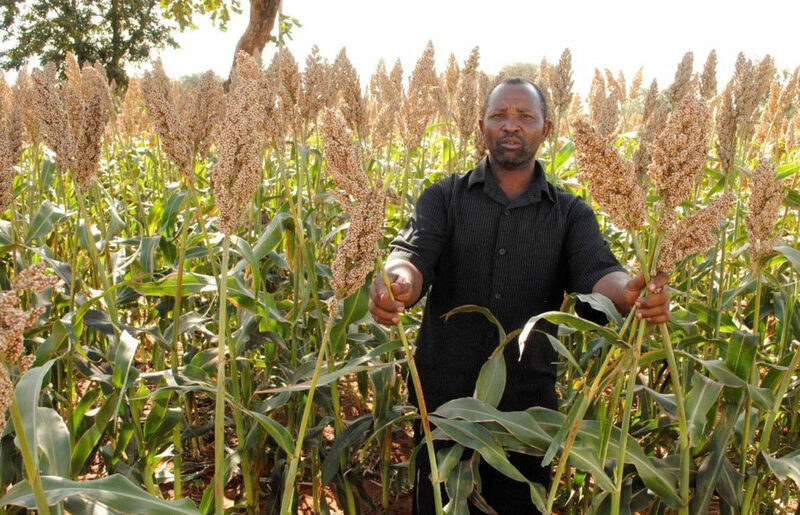 Previous ICRISAT research has shown that a 200 m2 BDL plot could yield an annual income of FCFA 50,000 (approximately 100 US dollars), which is equivalent to what men traditionally earn from millet production per hectare. A mid-term evaluation has estimated that women engaged in BDL groups have doubled their incomes compared to other non BDL families. Impact on family nutrition is also undeniable. Vegetable and trees improve diet diversity and bring essential nutrients that the staple foods like millets and sorghum do not have. For instance, the leaves of moringa, a tree originated from Ethiopia, are packed with three times more iron than spinach and four times more calcium than milk. Women also dry surplus okras they gain during the production glut in August-September, so that they cook it later, providing nutritious food supplementation for up to 5 months during the dry season. Choice of site is important. BDL is like a green oasis in middle of barren lands that attracts goats and other livestock that don’t have much to eat at this time. To avoid conflicts with herders, it is not recommended to use degraded lands near pasture. Because of free grazing roaming pastoralism in Niger, solid tall fencing or thorny hedges are essential to protect the plants from the start. Clarification of land ownership with the local authorities is also very important as in some cases, potential owners try to claim the land once the plot becomes productive. From the 167 sites planned initially, half are now cultivated by 87 women’s groups, representing 145 hectares of restored land in a recent assessment. A close source of water is essential for minimum watering of trees until they are well established. The women’s group for each plot has six trees to take care off. But too much water is not good either as trees have to develop their roots deep in the soil. Watering once a week is enough for the first 2-3 years. PASAM-TAI’s experience also shows the need for appropriate training and discussion with the families so that they understand that the outcomes even from the first year largely outweigh the required labor to prepare the land. CRS country director, Jean-Marie Adrian, recommends that the community contributes up front with labor and tools, to test the genuine interest for BDL. Providing food for work for instance had some drawbacks, as for some participants, food aid was the reason to join the group, rather than wanting to cultivate the land. Women’s workload is a dimension any rural project should not ignore. Land regeneration requires physical work especially for the first year when digging zai or half-moon pits. Accompanying measures to reduce women’s workload in the community, such as providing a communal grinding mill or piped water system would help. ICRISAT scientist Fatondji Dougbedji, stresses that though BDL is meant for women, husbands and other men of the community should be encouraged to assist them for the planting work, especially at the beginning. After the first harvests, most families are convinced. Looking at the impact on incomes and family nutrition, BDL ticks many boxes: gender, food and nutrition security and climate resilience. We need to scale up this inclusive farming practice so more families in rural Niger nurture their roots in a more food secure community. The 5 year project PASAM-TAI is funded by USAID’s Food for Peace and led by the NGO Catholic Relief Service and the research organization ICRISAT, part of the CGIAR, aims at reversing both the gender and environmental handicaps of poor land rights for women and widespread land desertification through the Bioreclamation of Degraded Lands (BDL). Early adoption studies in Nigeria reveal promising adoption rates for improved groundnut varieties. In the five states targeted for USAID project implementation, groundnut varieties Samnut 24, Samnut 25, and Samnut 26 are being used by at least 36% of farmers, with most farmers planting more than one. About 82% of the farmers interviewed re-affirmed their preference for Samnut 24. In communities not targeted by the project, farmers have been using both local and improved varieties, with Samnut 24 being used by over half (55%) of the farmers. 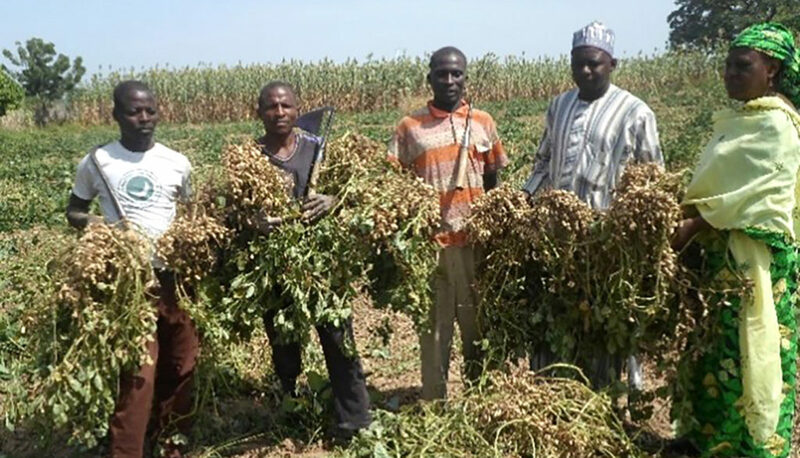 This may be good news for Nigeria, which used to be a leading exporter of groundnut in the 1960s and early 1970s but saw rosette disease and drought destroy nearly one million hectares of cultivated groundnut in northern Nigeria. There is hope that the groundnut pyramids — sacks of groundnut stacked up in pyramid-like structures that signified prosperity and served as a tourist attraction — which once dotted the landscape could return, thanks to the Nigerian government’s efforts. 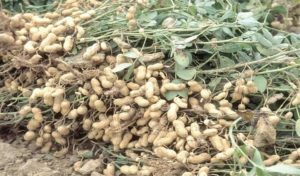 Rosette-resistant groundnut varieties developed by ICRISAT’s scientists, in partnership with the Institute for Agricultural Research (IAR) of the Ahmadu Bello University, are helping in the efforts. In 2012, ICRISAT was contracted to provide technical support to the groundnut value chain of the Agricultural Transformation Agenda of the Federal Ministry of Agriculture and Rural Development, Nigeria. In northern Nigeria, groundnut is grown mainly under rain-fed conditions by resource poor farmers. Cultivation received a boost with the release of early-maturing Samnut 24 (ICIAR 19BT) in January 2012 and the introduction of practices encouraging dry season groundnut cultivation for seed, grain and fodder. This also helped improve seed availability in the rainy season. In addition, farmers made appreciable profits selling fodder produced during the dry season. Two other varieties [Samnut 25 (ICGX-SM-00020/PS/P10) and Samnut 26 (ICGX-SM-00018/P5/P15/P2)] were released in December 2014. Beginning in 2015, ICRISAT Nigeria facilitated the setting up of 31 hectares of community-based seed production plots with Samnut 24; seed multiplication plots have been doubling in subsequent cropping seasons in the five northern states targeted for project implementation. State-based initiatives for their promotion have increased. In Jigawa State, for example, while 1,735 hectares were planted with Samnut 24 during the 2016 cropping season, this grew to 3,528 hectares during the 2017 cropping season. Now, other project and non-project states have embarked on promoting these improved groundnut varieties. In addition to the improved varieties, 1223 lead farmers improved their knowledge and skills in integrated crop management (ICM) through training between August 2015 and June 2017. This excluded farmer-to-farmer exchanges. Collaboration among donor-funded projects (USAID-Groundnut Upscaling, TL III and FAO) and civil society organizations has taken improved groundnut varieties to 12 additional states, as against the initial 6. Over 10 tons of Breeder seeds and 65 tons of Foundation seed were distributed to seed companies and community seed producers in Nigeria and partners in Ghana. 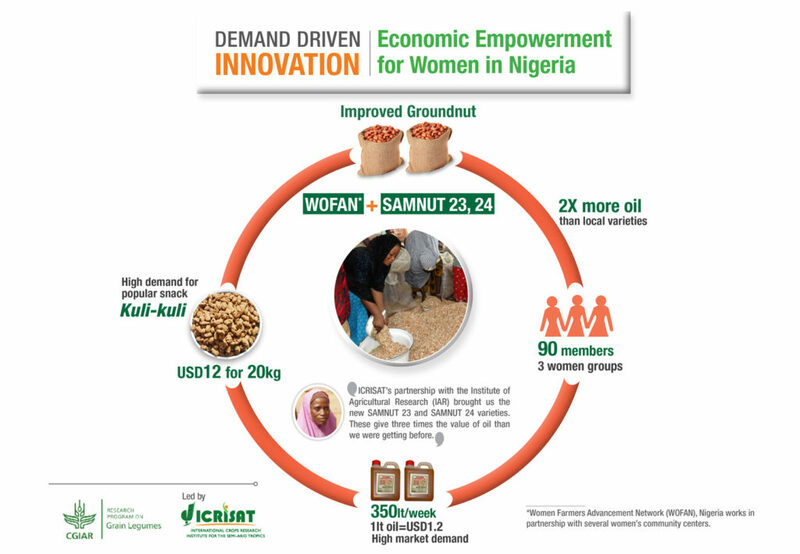 An example of ICRISAT’s demand-driven innovation in Nigeria: Oil-rich groundnut varieties (Samnut 23, 24) have increased prosperity, provided employment, and proven instrumental in empowering women (Source: ICRISAT). Increasing Groundnut Productivity of Smallholder farmers in Ghana, Mali and Nigeria (2015-2018): Institute for Agricultural Research (IAR); Centre for Dryland Agriculture/Bayero University, Kano (CDA/BUK); National Agricultural Seeds Council (NASC); Federal University of Agriculture, Markudi (FUAM Green Sahel Agricultural and Rural Development Initiative (GSARDI); Catholic Relief Services (CRS); Women Farmers Advancement Network (WOFAN);and Agricultural Development Projects of Jigawa, Kano, Katsina, Kebbi and Sokoto States. Groundnut value chain of the Agricultural Transformation Agenda (ATA) (2012-2014): Federal Ministry of Agriculture and Rural Development (FMARD); IAR; CDA/BUK; NASC; GSARDI; WOFAN; and Agricultural Development Projects of Bauchi, Gombe, Jigawa, Kano, Katsina, Kebbi, Kwara, Niger, Sokoto and Yobe States. Tropical Legumes (TL III): IAR; CDA/BUK; NASC GSARDI; WOFAN; and Agricultural Development Projects of Kano, Jigawa, Katsina and Bauchi States. Funders: United States Agency for International Development (USAID); Bill & Melinda Gates Foundation (BMGF); and Federal Government of Nigeria. Access to good seeds is often branded by development experts as the missing link to food security and agricultural growth for many farmers in sub-Saharan Africa. Less than 20 percent of Africa’s farmland is planted with improved crop varieties. This is particularly true for tropical legumes like groundnut, common bean or pigeonpea. An innovative groundnut seed revolving fund in Malawi, set up by the International Crops Research Institute for the Semi-Arid Tropics (ICRISAT) in 1999, thanks to USAID and Irish Aid support, and managed by and for the smallholder farmers, has nurtured a solid local private seed industry and boosted the groundnut production. The young Malawi nation (two out of three people are under 25) is ranked among the poorest countries. The majority of households rely heavily on the climate-affected agriculture sector, and two consecutive drought years prevented any improvements in their living standards. Maize production, the dominant staple food, dropped by a third in 2016 (WB data). Boosting smallholder farm productivity is seen as key to reducing widespread poverty. A better diversity on farms and plates would certainly help livelihoods and nutrition, as was recently concluded in a global nutrition review. A good step forward would be for Malawi smallholder farmers to grow more nutritious nitrogen-fixing legumes like groundnut and pigeonpea. One limiting factor is that they have little access to quality legume seeds. The private seed sector has not been investing to produce improved legume seeds, and when they want to renew their seed stock, smallholder farmers rely on informal seed channels, from exchange between neighbors or kin to buying grain converted to seeds of doubtful quality at the local market. ICRISAT has set up an innovative seed revolving fund to reverse this situation by providing high quality seeds of improved varieties in a sustainable manner and at a reasonable cost for Malawi smallholdings. USAID gave the start-up funding for farmers to produce groundnut foundation seeds in 1999. With later support from Irish Aid, this seed revolving scheme has now generated a vibrant local seed industry, producing tons of foundation and then certified seeds of crop varieties that are pest-resistant, drought-tolerant and high-yielding. As a result, groundnut production and incomes rose for many smallholder farmers, like Mary Kumwenda. 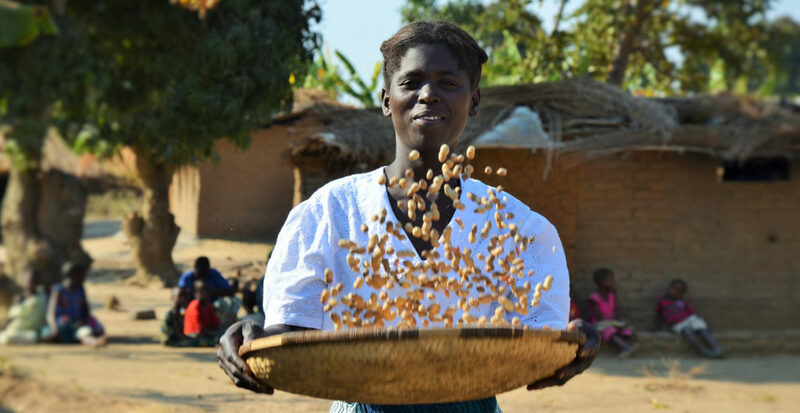 Farm laborer and mother of three, Mary joined Madede seed growers club in Mzimba District of Malawi in 2012, where she was trained in groundnut seed production and received 20 kg of groundnut breeder seeds for multiplication. She harvested 222 kgs of basic seed and made a decent MWK 78,000 profit (about $107). The next year, she doubled the surface and tripled seed production thanks to good rains. She made a profit of MWK 321,000, about 1.5 times the national average income. How Does the Seed Revolving Fund (SRF) Work? Central to the SRF are the seed producing clubs of 10-15 smallholder farmers which are trained in seed production, management and group dynamics. These clubs are contracted by the SRF to produce foundation seeds, which are bought back at agreed prices. Small growers like Mary receive the pre-basic seeds on credit from ICRISAT, while individual larger farmers, who could also be contracted to multiply seeds for the SRF, have to pay for the early generation seeds in advance. Foundation seeds are then sold to local seed ventures for multiplication into certified seeds, which are then sold to farmers by agrodealers. Proceeds of the sales realized through the SRF cover the cost of warehouse, seed packaging and transport, and the seed fund is able to engage more smallholder farmers every year. 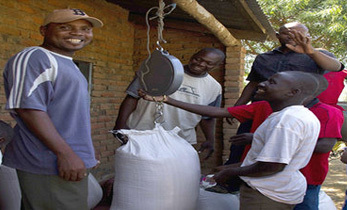 From 2008, besides foundation seed production, SRF moved to include certified seed production to supply the Malawi government-supported Farm Inputs Subsidy Program. It follows a proper business model, with key decisions on variety choice based on market needs, seed quantity, coverage strategy, seed quality assurance system and seed pricing for SRF sustainability. For Mary, the groundnut seed revolving fund is a real change maker. The proceeds of her seed activity helped her to make her farming system more profitable. She has gained a sense of entrepreneurship and now feels her family is food secure. “With the seed sales, I was able to start a small fritter business. I also bought some fertilizer for my maize field. The seed incomes kept my family food secure throughout the year, and we will soon move from our small grass thatch hut to my dream house, with a concrete floor and solid iron sheet roof,” she says. Mary’s example is not a unique “gender empowerment” story, as the seed producing clubs enroll many women (47 percent of their members are women) — a rightful return, as women have a traditional role of household “seed security guardian,” especially for grain legumes. As it grows, the seed fund is diversifying into more crops, like common beans and pigeonpea, with local seed companies getting more involved particularly in certified seed production and marketing, as they began to see the value for money in producing quality legumes seeds. Most of these seed ventures are members of the Malawi Seed Alliance, an association created by ICRISAT to manage the seed revolving fund. Average groundnut yield has been very low for years, as farmers face many constraints from poor soils, pests or drought. 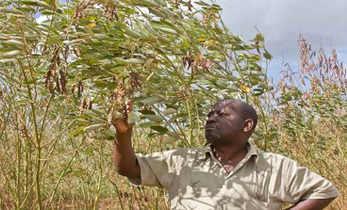 Over the years, ICRISAT and the Malawi groundnut research institutions have developed improved varieties like the Nsinjiro, a confectionary type peanut that is resistant to rosette — a very damaging groundnut virus transmitted by insect bites, which stops plant growth and taints the foliage — and high yielding. Community seed systems like village seed banks have increased access to such improved seeds, reaching almost 50,000 farmers over ten years. The seed revolving fund has now scaled up further thanks to its cost-recovery and engagement of the private sector. One key to success is building a seed trust. However, as in many African countries, seed certification is often ensured by run-down seed certification services with prohibitive certification costs for small seed growers. Under the Feed the Future Malawi Improved Seed Systems and Technologies (FtF-MISST) initiative, ICRISAT has partnered with the Seed Services Unit (SSU), Malawi’s legal body to stamp seed quality labels, to make their seed certification more cost-effective and transparent as well as enlarge their field of action. Training of 166 para seed inspectors has already eased SSU’s work. ICRISAT is currently developing a mobile application that will be deployed by the end of the year and will help plan the para inspectors’ field visits, informing them when it is best to visit farmers. This seed quality traceability app has several ways to improve transparency and trust in the seed certification process. Seeds given to seed growers for multiplication will be tagged with a unique barcode. Farmers that comply with the seed inspection checklist will receive a unique quality certificate, and mobile GPS tracking helps SSU check that seed inspectors are following the right field inspection procedure. Local seed ventures that register for the app could check that quality insurance is traced from start to end, for instance verifying that seed quantities delivered by one grower are credible and correspond to the right variety. Once a groundnut exporter, Malawi groundnut production collapsed in the 1980s and 1990s, and average yields plummeted to around 860 kg/ha in the early 2000s. Now, Malawi is back in the global peanut marketplace, exporting once again to Europe with, for instance, the fairtrade label Liberation Foods by Malawi farmers organization NASFAM. Yields have almost doubled since 2000 to around 1,500 kg/ha. ICRISAT’s seed revolving fund has been instrumental in this groundnut revival. Mary has no need to worry about her family’s future. Her neighboring farmers will need more groundnut seeds in the years to come, and they are ready to pay for the quality. To learn more about ICRISAT’s seed systems work in Africa and Asia, read ICRISAT’s Seed Systems: Models and Lessons Learned. Read the post on the Agrilinks blog. With his hand on his heart, farmer Moobed says, “I am a man of the desert and it is my heart’s wish that you come again and help us”. This was the message to a group of ICRISAT scientists invited by the Government of Iran to assist with more drought tolerant and resilient crops. Increasing water shortages, overuse of ground water, harsh environments, degraded soils, increasing salinity and rising temperatures - Iran’s farmers battle a whole host of adversities. Wishing to transform its agricultural systems to cope with these challenges, several Iranian ministries have come together to escalate solutions. This included asking ICRISAT to help with its expertise in its mandate crops of sorghum, millets and chickpea. 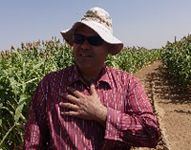 Iran currently produces sugarcane, rice and wheat, but as Dr Babak Nakhoda, Head, Department of the Molecular Plant Physiology, Agricultural Biotechnology Research Institute noted, these crops require extensive irrigation, as opposed to crops like sorghum and millets, that can grow on less – less water and fewer inputs. Dr Babak explains the needs and changes to the agricultural system in Iran. At the invitation of AREEO, an ICRISAT delegation travelled to Iran 1-6 Oct 2017 to explore opportunities for collaboration. The delegation met with Iranian research institutes, representatives from CGIAR Centers with offices in Iran (CIMMYT, ICARDA, IRRI) and local farmers. Dr Peter Carberry, Deputy Director General – Research at ICRISAT led discussions and noted that, “All your areas of interest you mentioned are our areas of expertise”. As a starting point, ICRISAT improved germplasm will be provided to AREEO researchers. Further collaboration will depend on negotiations on areas of mutual research interest. Photo caption: ICRISAT’s team interacts with Iranian farmers and scientists to assess the potential for collaborations. ICRISAT scientists also interacted with farmers as part of their visit. Farmer Moobed explained to ICRISAT scientists, “Four years ago this was just desert. When I planted it was 50o C and the maize did not produce. Now I have moved from maize to sorghum, I have a crop. I turned the desert green with sorghum”. Dairy producers such as Moobed currently prefer maize and achieve good milk productivity. However, most do not consider growing sorghum for feed and forage because it is foreign to them. With increasing temperatures and stress on water resources, some farmers have little option but to switch to dryland crops. Farmer Maleki and his son turned to millets to cope with the changes. They ran an orchard 25 years ago but irrigation led to high soil salinity and all their trees died. “Thanks to advice from Dr Masoud Torabi, Sorghum Breeder, Department of Crop science, Esfahan Agriculture and Natural Resources Research and Education Center, AREEO, we now grow foxtail and proso (common) millet. We really had no choice as nothing else could survive in these soils.” With almost 4 tons per hectare of millets in saline and alkali soil with low quality water, the next challenge for this farmer and many others is marketing their products in a fragile market where there is no demand for their grains except for birdfeed! This underlines the immediate need to create value chains which can help farmers to earn more money from their fields, create jobs for their families and get them involved in the whole value chain. Hence, farmers can aspire for better livelihoods. As almost no sorghum or millet products are currently sold for human consumption, the potential to develop businesses and employment through promoting their high nutrition and health benefits was recognized in discussions. Currently there are few gluten-free wheat-alternative products available in Iran and people with gluten-intolerance have to import their own products at very high prices. Diabetes is a problem and, given that millets and sorghum having low glycemic index, they can be a good food for managing or preventing diabetes, especially as an alternative to white rice. The high macro and micronutrients of millets and sorghum, like calcium and iron, were also seen great selling points for developing the market. Quinoa was not known a few years ago, but with popularity in other parts of the world and marketing in Iran, this is now available and consumers pay high prices. It is an example to show that consumer markets can be developed with a product that provides value and is marketed well. In fact, foxtail millet (commonly known as Gavars) is an ancient grain of a specific area in south-east Iran and is still eaten today. During winter and during Ramadan, its slow digestibility provides energy for a longer time. It is traditionally eaten as a porridge or with a meat or as a flour to make chapattis. However, this is very localized and not known outside of this area. The little awareness about millets and sorghum is of an image of being a poor persons’ food – a similar issue in many parts of India and Africa. iii) develop the whole value chain, including processed products and consumer markets of these as a Smart Food. Chickpea to be made part of the government’s Enhancing Food Security Program, with a strong crop improvement component. Immediate actions will include sharing of genetic material from the ICRISAT genebank, building of the capacities of researchers and students from Iran, and scientist-to-scientist knowledge sharing, especially on the breeding system. 4 million farms with an average size of 0.7 ha. 16 million people work on the farms. 47% of jobs are in agriculture. 120 million ha are affected by soil erosion. 40 million ha are affected by wind erosion. 2 billion tons of soil are lost every year through erosion. There’s a marked increase in soil and ground water salinity due to long term irrigation schemes. Climate change has led to extreme temperatures and reduction in rainfall: more extreme high and minimum temperatures, especially in winter. Water run-off is now being managed better through the construction of underground dams. Only one hybrid currently exists in Iran. Speed Feed is from Pacific Seeds Australia. Few varieties are grown in Iran: 80-85% is Speed Feed, 8-10% local varieties (mainly for grain) and about 4-5% Pegah variety based on ICRISAT germplasm and developed by SPII, AREEO. No hybrids exist in Iran except Nutrifeed which was first imported in the 1990s from Pacific Seeds Australia and evaluated in multilocation trials in Iran. 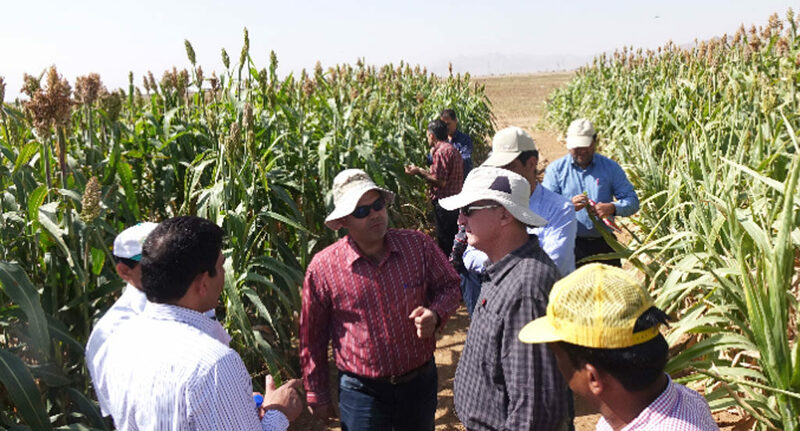 This multi-cut hybrid imported from Advanta Seeds, India, is being registered in Iran by Dr. Babak Nakhoda to be introduced to farmers in the southern provinces of Iran as a high quality summer forage crop with higher water productivity. Pearl, foxtail and common (Proso) are the only millets grown in Iran. 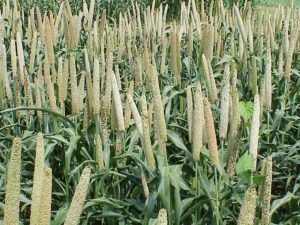 A maximum of 10,000 ha of millets are cultivated in the country. Includes 11,000 food legumes including 5700 chickpea (3300 Desi, 2000 Kabuli, and rest wild type); 2700-2800 lentil, 175 broad bean, 2440 beans, 85 pea, and about 312 mung bean and 400 cow pea all of which have been fully characterized based on descriptors. There are 342 accessions of sorghum and 271 accessions of millets (mainly Panicum and Setaria); 50% of this collection is characterized. Two millet cultivars have been released by SPII (one Setaria and one Panicum, namely Bastan and Pishahang). About 95% of farmers have smart phones but rarely is agriculture-relevant information shared through mobile technology. This technology is in high demand by different research institutions under AREEO (especially SPII and ASRI) for better communication with farmers in remote areas. ICRISAT’s experience and expertise are needed to establish the platform. 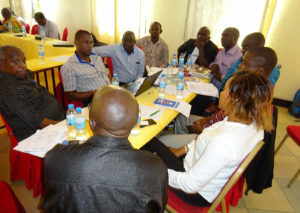 A survey showed that most information about scientific technologies and practices was not reaching the farmers so a major new extension approach is just being set up including: apps targeting farmers; focused areas for extension officers; webinars to farmers through video conferencing; creation of educational videos for farmers; open-access databases so scientists and farmers have easy access to relevant publications and materials. One of the most important ways of achieving ‘Zero Hunger’ by the year 2030 – one of the UN’s Sustainable Development Goals (SDG#2) – is by making agriculture attractive and profitable to the youth around the world. 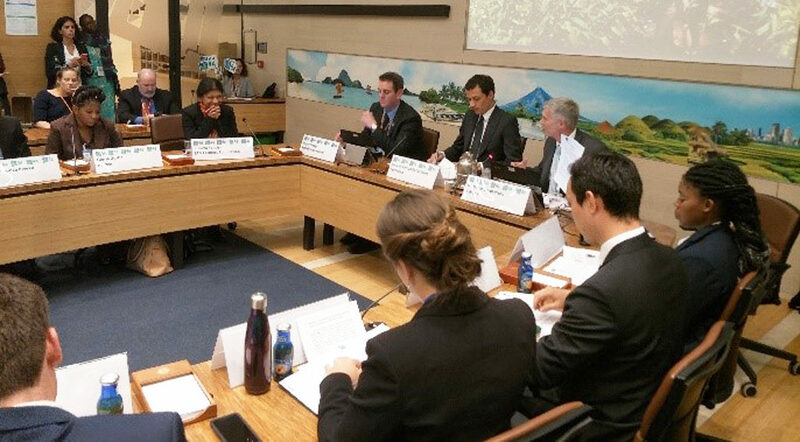 To try and understand the needs of young agricultural leaders from across the globe, a panel discussion was conducted by the Food and Agriculture Organization (FAO) in Rome, Italy, as a side event of the CFS 44 (44th Session of the Committee on World Food Security). 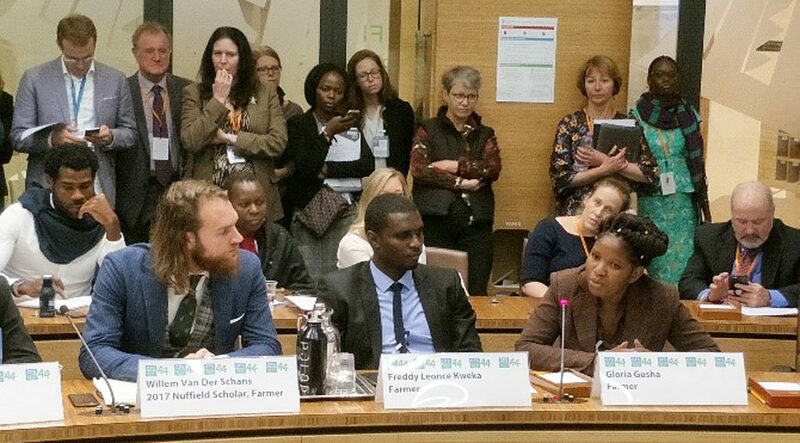 The event – What today’s young agricultural leaders need to meet tomorrow’s SDG challenges – highlighted the views and challenges of a younger generation of farmers. The panel was chaired by Luis Fernando Ceciliano, Representative of the Permanent Mission of Costa Rica to the UN-Rome Agencies and Dr David Bergvinson, Director General, ICRISAT, co-moderated the panel discussion. Thato Moagi, a mixed crop and livestock farmer from South Africa, spoke up about the need to integrate agriculture into the education system right from preschool onwards. This would go a long way in developing interest in agriculture in children. She also believed that new initiatives to link young people to established farmers would be beneficial to the youth in understanding the vocation of farming. Appealing for more support, Gloria Gusha, a mixed farmer and agricultural extension officer from Zimbabwe, said that the lack of resources and backstopping was a roadblock in creating any new initiatives. A Tanzanian farmer and agricultural extension officer, Freddy Leonce Kweka, rued the slow adoption of new technologies by farmers. He believed that more farmers could be convinced to adopt new technology if they could see firsthand, the impact of technology with the help of pilots and demonstrations. Dr Bergvinson proposed that agriculture had to be rebranded and made ‘cool’ so as to attract more youth to it, by thinking out of the box. One such out-of-the-box idea was linking agriculture with unlikely partners such as the fashion industry, suggested Tsuyoshi Stuart Oda, a Japanese investment banker-turned-urban farmer. “Making agriculture attractive is the key to a more professional attitude towards farming,” stated Willem van der Schans, a Dutch livestock and dairy farmer. While most of the panelists agreed that farming was no longer seen as a desirable career option, Sarah Singla, a no-till mixed crop farmer from France, claimed that in France many urban professionals were giving up city life to turn to farming. From the gender perspective, an important statement was made by Tiare Boyes, a commercial Halibut fisher from Canada. Stating that she had been told numerous times that she could not be in the business of fishing, she demanded creation of space in this area for women. This panel discussion was a significant step towards shining a spotlight on young agriculture leaders in the developing as well as developed world. It highlighted the requirements of food producers, agricultural SMEs and multi-stakeholders so that they could contribute to the complex challenge of sustaining a growing population. The discussion, held on 9 October 2017 at FAO, Rome, Italy, was organized by Nuffield International and the ETG Farmers Foundation. The ICRISAT genebank in India chronicles over 10,000 years of cultivated dryland crops history. It conserves over 120,494 accessions of dryland cereals and legumes from 137 countries. This genetic diversity has also been saved for posterity in the Svalbard Global Seed Vault also known as the ‘doomsday vault’, in Norway. Safeguarding, maintaining and expanding valuable collections in genebanks is a humongous task. The aim of phytosanitation is to ensure that seed and plant materials are pest and disease free. At ICRISAT, this task is under the responsibility of the Plant Quarantine Unit (PQU). This unit is also responsible for the international exchange of germplasm and for ensuring that the plant material periodically regenerated by the genebank is clean. It services the genebank, the breeding units of the mandate crops and also other CGIAR centers housed at ICRISAT. As the Germplasm Health Units (GHU) of CGIAR Research Centers observe International Phytosanitary Awareness Week, exceptional achievements in this domain deserve mention. From 1973 to 2016, ICRISAT, in collaboration with the Indian authorities, facilitated export of 1.32 million seed samples of ICRISAT’s six mandate crops and small millets to 173 countries, and imported 180,000 seed samples from 96 countries, without introduction of any exotic pests into the importing country and in India. International exchange of germplasm is critical to genetic improvement of crop cultivars to meet the ever-increasing demand of food, feed and fodder and also to create backups in other locations in case of a manmade or natural disaster (the recent case of the seed bank in war-torn Syria was an eye-opener for international genebanks for creating emergency backups). International movement of seed material increases phytosanitary risks such as introduction of exotic insect pests and pathogens. In India, ICRISAT’s PQU, in collaboration with the National Bureau of Plant Genetic Resources (NBPGR) of the Indian Council of Agricultural Research (ICAR) and the Directorate of Plant Protection Quarantine Storage (DPPQS), plays an important role in minimizing such risks. “The role of PQU is crucial to prevent the entry of exotic pests which have the capacity to blow up into large-scale epidemics that can wipe out entire crops,” says Dr Rajan Sharma, Head, Plant Quarantine Unit, ICRISAT. A recent article in the The Guardian on the fall armyworm destroying cereals in Africa clearly illustrates this. “Originally from the Americas, caterpillars eat maize, a staple in many African countries. So far, they have been found in 28 African nations – 16 more than they were detected in five months ago. If nothing is done, they could eat between 20% and 50% of the maize produced in 12 of Africa’s maize-producing countries…” says the article. Referring to the many stringent measures that are taken at ICRISAT with regard to phytosanitation, Dr Sharma cites the example of how a possible epidemic of downy mildew in hybrid pearl millet was contained. Blast (Pyricularia grisea) in small millets from Zimbabwe (2003) and Nepal (2012). Bacterial wilt (Ralstonia solanacearum) in wild Arachis from Brazil (1998), Australia (2000), Malawi (2003) and Senegal (2012). Peanut stripe virus in Arachis spp. from China (1996), Japan (2006) and Senegal (2012). Some of these infected consignments could be partly salvaged, while some had to be incinerated. 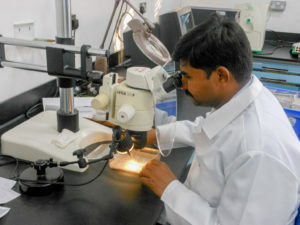 The ICRISAT PQU uses state-of-the-art screening tools and techniques for pest and disease detection that include tests like ELISA, agar and radiography depending on the crop. Suitable seed dressing chemicals are used to eliminate seed-borne organisms during export/import. The various legal requirements for the issuance of a phytosanitary certificate and import permit are meticulously followed. India is a signatory to the World Trade Organization’s Sanitary and Phytosanitary Agreement and since 1986, NBPGR is the regulating agency for exports and imports. All imported crop germplasm are grown in isolated plots (PEQIA) or the PQ greenhouse for pest and pathogen inspection and release by NBPGR. Currently, ICRISAT’s PQU is working towards using more sensitive diagnostic tools that facilitate molecular detection of pests and pathogens. As part of the International Phytosanitary Awareness Week program, national and regional station heads of ICAR-NBPGR were invited to address ICRISAT scientists on 26 October. Dr SC Dubey, Principal Scientist and Head, Division of Plant Quarantine, spoke on Importance of ‘germplasm health’ in preventing transboundary spread of pests and pathogens. He cautioned that seed-borne pests and pathogens can survive in genebanks for decades and care needs to be taken to ensure seed health. He said that in India there was a need to improve screening procedures as there have been recent instances where new pests, pathogens and weeds have been introduced through imports. He commended ICRISAT and other CGIAR centers for maintaining a good track record over the last 50 years. Dr Sarath Babu, Principal Scientist and Officer-in-charge, Regional Station, Hyderabad, spoke on Emerging challenges to international distribution of germplasm. He dwelt on the recent stringent export regulations introduced in India to safeguard the nation’s biodiversity. In fact, a recent article that appeared in the Financial Express tells how Indian officials were able to contain damage on discovering the entry of wheat blast disease from Bangladesh. In the question-answer session that followed, ICRISAT scientists talked about the difficulty they were facing in exporting material of ‘unknown’ origin or those that had even one line of Indian origin (not FAO designated ) in their pedigree. The officials said that a permission from the National Biodiversity Authority was needed and that with the introduction of online filing, the process is taking much lesser time than before. Dr Suhas Wani, Research Program Director-Asia, presided over the seminar and urged the scientists to share their learnings from the seminar with colleagues. Dr Rajan Sharma, who organized the seminar, highlighted the role of ICRISAT PQU/GHU in international distribution of pest-free germplasm. Agricultural scientists from the United Kingdom and India discussed ways of developing crop varieties with better nitrogen absorption and utilization at the annual meeting of the Cambridge-India Network for Translational Research in Nitrogen (CINTRIN). The global demand for nitrogen (N) fertilizer for agriculture is projected to reach ~250 million tons per year by the year 2050 (from the current ~110 million tons per year). A substantial amount (>50% in some cases) of N applied to the soil is lost by leaching, runoff and denitrification. In addition to adding to the crop production costs, these processes pollute the groundwater, adversely affect soil structure, and damage the environment through increase in levels of nitric oxide, ozone etc. CINTRIN aims not only to improve the income and livelihood of farmers by reducing inputs cost, but also to save the environment by minimizing the negative impacts of excessive use of fertilizers. CINTRIN scientists are studying the natural variation for nitrogen use efficiency (NUE) in diverse crops such as wheat, sorghum, pearl millet and foxtail millet. The findings will be applied to develop new breeding lines with enhanced NUE. CINTRIN also uses model plants such as Arabidopsis and Brachypodium for basic research which will be translated into crops in future. In addition, it will deliver a translational pipeline to produce new cereal varieties for optimized nitrogen use in agriculture. During the three-day meeting, the teams led by Principal Investigators Dr Rajeev Gupta (Principal Scientist & Theme Leader-Genomics and Trait Discovery, ICRISAT), and Dr Tina Barsby (CEO, NIAB), discussed the progress made in each of the six ‘Work Packages’ (goals) in the four target crops and shared lessons learnt which could be used to drive future plans. CINTRIN is led by ICRISAT, India, and the National Institute of Agricultural Botany (NIAB), UK. 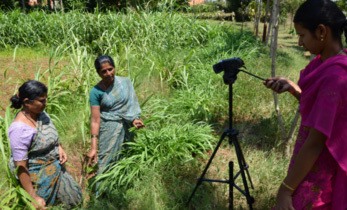 It is one of four Virtual Joint Centres in Agricultural Nitrogen, delivered in partnership by the Biotechnology and Biological Sciences Research Council (BBSRC), Newton Fund, and the Department of Biotechnology India (DBT). CINTRIN held its annual review meeting at ICRISAT HQ from 5-7 October 2017. 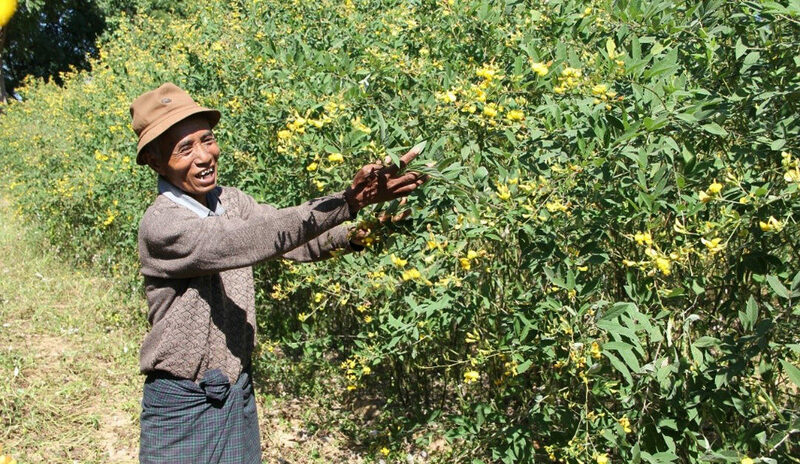 A Myanmar farmer with an improved variety of pigeonpea. Photo: Pooran Gaur, ICRISAT. 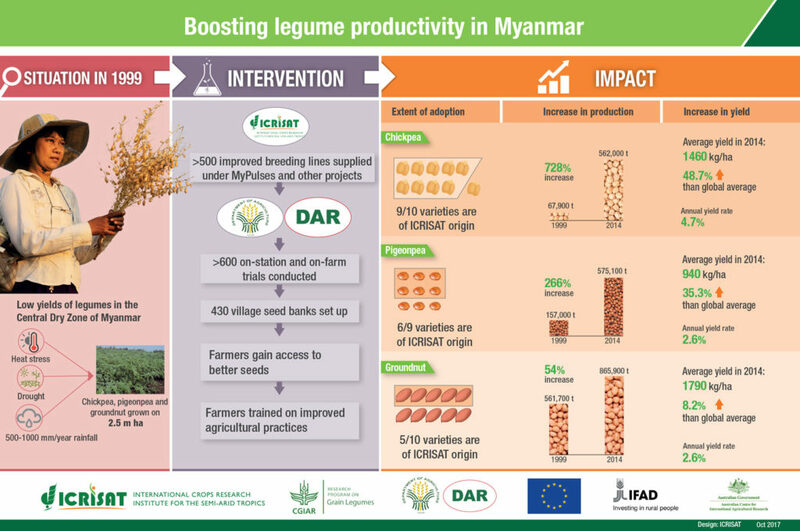 Smallholder farmers in Myanmar engaged in legume farming have benefited from the strong partnership between Myanmar and ICRISAT, India, in grain legumes improvement research over the last 30 years. A recent review meeting of the MyPulses (Increasing productivity of legume-based farming systems in the Central Dry Zone (CDZ) of Myanmar) project (2014–2017) highlighted its contributions towards improving the livelihoods of Myanmar’s legume farmers through research and extension. The CDZ spans 80,000 sq km in central Myanmar, where annual rainfall ranges from 500 to 1000 mm. 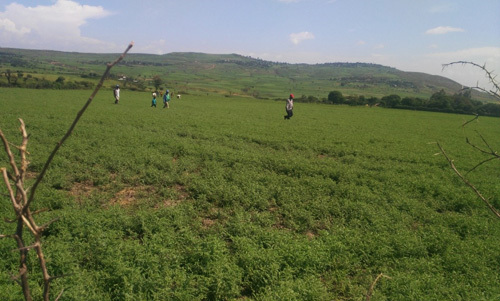 Legume crops, grown on about 2.5 million ha, are important in this region. ICRISAT has supplied about 500 improved breeding lines of chickpea, pigeonpea and groundnut to the Department of Agricultural Research (DAR) in Myanmar. Nine out of ten varieties of chickpea, six out of nine varieties of pigeonpea and five out of ten varieties of groundnut released in Myanmar are from ICRISAT- supplied germplasm and breeding lines. Chickpea production has seen a 728% increase (from 67,900 tons to 562,000 tons). Pigeonpea production has achieved a 266% increase (from 157,000 tons to 575,100 tons). Groundnut production has jumped 54% (from 561,700 tons to 865,900 tons) in 15 years (1999–2014). The compound annual growth rate in yield during this period was 4.7% for chickpea and 2.6% for pigeonpea and groundnut. During 2014, the average yields of chickpea, pigeonpea and groundnut in Myanmar were 1460, 940 and 1790 kg/ha, respectively, which are 48.7%, 35.3%, and 8.2% higher than the global average yields. Over 600 on-station mother trials and on-farm baby trials were conducted on improved varieties/candidate varieties of chickpea, pigeonpea and groundnut using farmer participatory varietal selection (FPVS) approach. Quality seed of high-yielding varieties are produced and distributed using the Village Seed Bank model. Across the CDZ, there are about 430 seed banks producing and selling seed (as of 2016-17). ICRISAT has also provided training to scientists and extension personnel from DAR and the Department of Agriculture (DoA), Myanmar, on breeding, crop and seed production of grain legumes, and integrated pest management, through field days and in-country training sessions. The project’s annual review meeting was held on 10-11 October 2017 at DAR, Yezin, Myanmar. ICRISAT participants included Drs Pooran Gaur (Project Coordinator from ICRISAT), P Janila, Anupama Hingane and D Kumaracharyulu. In early 2017, a gender study was conducted among 200 smallholder farmers from 20 communities in Ghana. It revealed that male groundnut farmers achieved 2.74% higher productivity compared to their female counterparts in the Northern Region of Ghana; in the Upper East and West Regions, the corresponding figures were 3.24% and 6.60% respectively. Among the prime factors determining productivity were membership of social groupings; use of improved seeds; participation in field trials; area under crop cultivation; years of experience in groundnut production; soil fertility status of fields and labor cost. The study showed that women farmers were probably unable to access and fully utilize these to achieve full production potential of their farms. Based on the results of this study, scientists, farmer groups and other stakeholders brainstormed ideas to reduce the significant productivity gap between male and female groundnut farmers in Ghana. The workshop was organized by the CSIR-Savanna Agricultural Research Institute (SARI) with support from the Tropical Legumes III (TL III) project. Encourage women to grow ‘Gender-sensitive’ crops, which are less labor- and machinery-intensive, so that they can be grown with minimal assistance. Form gender-based groups geared towards agricultural production should be encouraged as they acted as conduits for accessing credit and other financial assistance to enhance production. Form community-based seed production groups to produce quality seeds at reduced prices to help more farmers gain access to improved seeds. Motivate women farmers to participate in field trials or demonstrations, which serve as sites for technology transfer. The government should draft financial policies that enabled farmers to take loans to expand production. Encourage greater participation of women in groundnut innovation/multi-stakeholder platforms. Set up schools close to farming communities and imparting training in local dialects. Introduce more Village Loans and Savings Associations (VLSA) to provide credit to female farmers. The Ministry of Gender, Children and Social Protection must empower vulnerable women in the communities, by way of policy and aid, to take up crop production. Yield levels, rates of input use, rates of adoption of modern technologies, and access to credit and insurance markets have been identified over the years as the fundamental factors that control agricultural productivity. 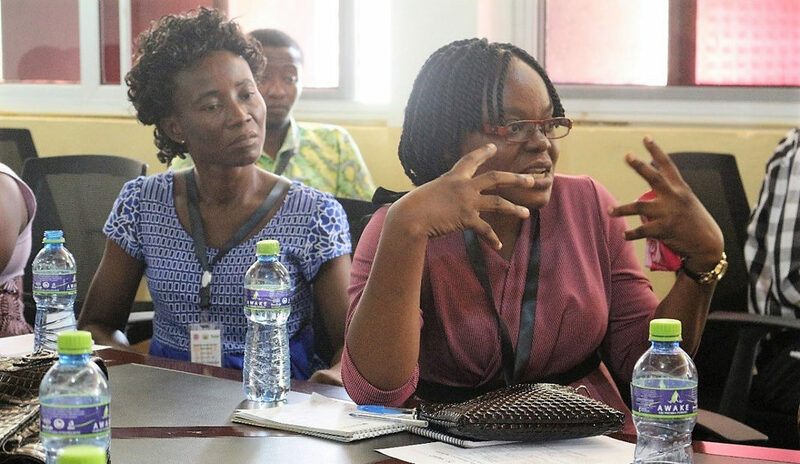 By empowering women farmers with these tools, scientists hope to see an overall increase in groundnut productivity, which would be instrumental in reducing food insecurity and poverty rates in Ghana, particularly in rural areas. Ms Priyanka, Scientific Officer, briefing participants on the products developed at NutriPlus Knowledge Centre. “I’ve been associated with ICRISAT since 2015, when ICRISAT came to Siaya county in Nyanza province. These regions are rainfed, with just 500-600 mm of rainfall a year. Since ICRISAT first brought seeds of sorghum, finger millet and green gram, there’s food and peace in the region. However, due to lack of information, farmers are not adopting these crops. During the workshop, I learnt more about how these crops can be used to make tasty and nutritious recipes and processed for markets using small machines. I want to take this knowledge to farmers in my region to create employment opportunities for their children and protect them from companies that exploit them by underpaying for their produce,” said Ms Priscilla Roberts, an extension worker from Kenya who took part in a training program conducted to enhance capabilities of African NARS partners of ICRISAT in food processing (including technologies and business opportunities). 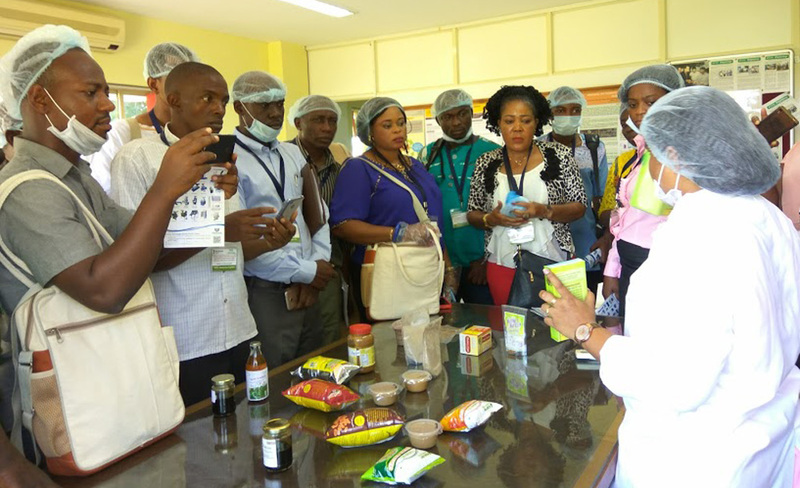 The capacity building and training program was held at ICRISAT, through its Agribusiness and Innovation Platform (AIP) under the India-Africa Forum Summit III (IAFS-III). The 15-day training program ‘Technologies and Business Opportunities in Food Processing for SMEs’ was conducted during 9–20 October 2017, to boost the nations’ economies by promoting food-based entrepreneurship. This training program focused on several aspects of food processing, with key areas being the Identification and mapping of opportunities, value chain analysis and development, food safety and compliances, business plan development and raising capital for SMEs, intellectual property rights and technology rights, leveraging ICTs for digital agriculture and food supply chains, advances in food processing technologies, and the setting up of incubators for promoting entrepreneurship. Participants obtained hands-on training on several technologies and learnt how to set up processing units based on these technologies. The training program included lectures by industry experts and talks based on personal entrepreneurial journeys by successful entrepreneurs. This gave the participants inspiration and ideas about starting small- and medium-sized enterprises (SMEs) and managing them profitably. The trainees also visited the pilot facility at NutriPlus Knowledge Centre, Indian Institute of Millet Research, Centre for Entrepreneurship Development, Grameen Mall at Hyderabad and SV Agri and National Institute of Post Harvest Technology (NIPHT) at Pune. “We have been exposed to a number of value-added products, like millets, sorghum and Irish potatoes in this training program. After this, I want to help farmers grow these crops. In collaboration with partners like ICRISAT, I want to revive interest in these crops and in consuming and processing them using appropriate machinery. Because of the workshop, I realized that in addition to banana processing, there is a lot of potential in sorghum and millets. I am now looking to diversifying into those value chains so I can get products of a higher value,” said Mr Adams Nkwatsibwe, Director, Noble Agro Innovations Ltd, Uganda. The training program was organized with support from the Ministry of External Affairs, Government of India. Participants consisted of 35 delegates (including 16 women) from 12 African nations: Kenya, Ghana, Nigeria, Tanzania, Zambia, Uganda, Niger, Mali, Mauritius, Namibia, Sudan and South Sudan. Under the IAFS-III, AIP has been entrusted by the Indian Ministry of External Affairs to organize three training programs of which this was the first. The second training session on ‘Entrepreneurship and Marketing Skills Development’ will be held during 12-25 November 2017 at ICRISAT. 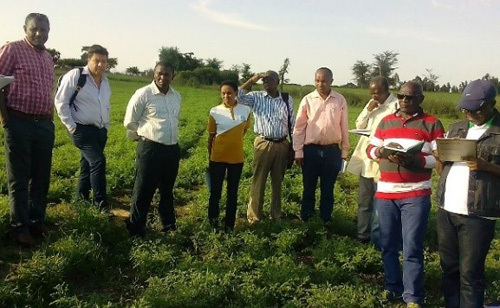 The Food and Agriculture Organization (FAO) selected several locations of the Tropical Legumes III (TL III) project to illustrate the learning of good practices in crop breeding and seed delivery. It facilitated a three-day program in Addis Ababa, Ethiopia, focused on the ‘Use of quality seed and adoption of improved crop varieties’, for agricultural experts from eight African countries: Cameroon, Chad, Cote d’Ivoire, Democratic Republic of Congo, Mali, Mozambique, Rwanda and Zambia. The organizations identified for this visit were three government institutions: Ethiopian Institute of Agricultural Research (EIAR), Ethiopian Agricultural Transformation agency (ATA), Ethiopian Agricultural Business Corporation (EABC); and three CGIAR centers: International Crops Research Institute for the Semi-Arid Tropics (ICRISAT), International Center for Agricultural Research in the Dry Areas (ICARDA) and International Maize and Wheat Improvement Center (CIMMYT). Community-based clustered seed production can effectively complement the formal seed sector. It is a viable option to promote often-neglected ‘orphan’ legume crops such as chickpea. Intervention by organizations such as ICARDA and ICRISAT, working with EIAR, has strengthened farmer organizations’ capacity to produce quality seed (at least QDS). A few farmer organizations have grown to PLC (company) levels. The key message that emerged was that by increasing availability and adoption of improved varieties, seeds and associated production packages, productivity of legumes in the drought-prone areas of sub-Saharan Africa was being boosted. During the tours, held on 12, 13 and 16 October 2017, the visitors were accompanied by two senior experts from FAO. Dr Asnake Fikre coordinated this visit on behalf of TL III, ICRISAT. Farmers gather for a field day at Dawakin. Farmers in the rural community of Dawakin Tofa Local Government Area of Kano State, northwestern Nigeria, were mainly subsistence farmers trying to earn a living from the harsh environmental conditions prevalent in the area noted for poor rainfall and nutrient-deficient soils causing repeated crop failures. 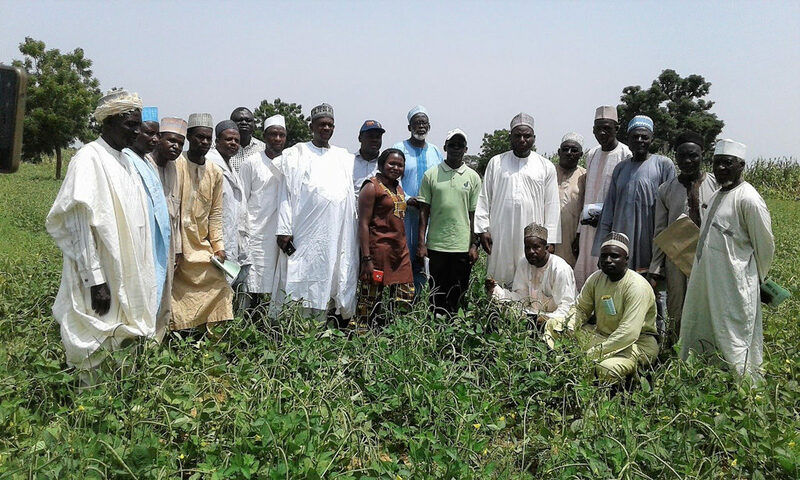 They introduced improved cowpea varieties to the villagers. These new varieties were resistant to the parasitic weed, Striga gesnerioides, which had been a menace to farmers in the area. The extension agents experimented in several small plots in farmers’ fields in the village to demonstrate the potential of cowpea-based farming systems and the use of improved cowpeas for quality seed production. Farmers were mobilized and organized into viable community-based organizations (CBOs). Innovations in crop production systems were applied. Farmers were linked with input dealers and large-scale seed buyers to guarantee post-production markets. The farmers produced more than their consumption needs. They sold the surplus for better incomes. This year, they expect even better yields and higher income from their cowpea seed farms. In order to celebrate these successes, and to highlight the potential of a new cowpea variety, a farmer’s field day was organized on 29 September 2017, in Dawakin. Representing the district head, Alhaji Mahammud Ubale appealed to KNARDA to “bring more of this seed for dry season farming in the community and also sell the seed to members of the community for next year’s planting”. A total of 170 farmers (135 men and 35 women), traditional rulers, government and TL III project representatives and other stakeholders, including Dr Chris Ojiewo, TL III project manager, attended the field day. review the project’s progress together with Mr Vamsidhar Reddy, project management specialist, attended the workshop remotely along with principal investigators from ICRISAT, Dr P Janila and Dr Saikat Datta Mazumdar. The workshop involved 10 enumerators (6 men and 4 women) who were trained on how to take the informed consent of survey participants, how to use tablet-based surveys and capture digital data. 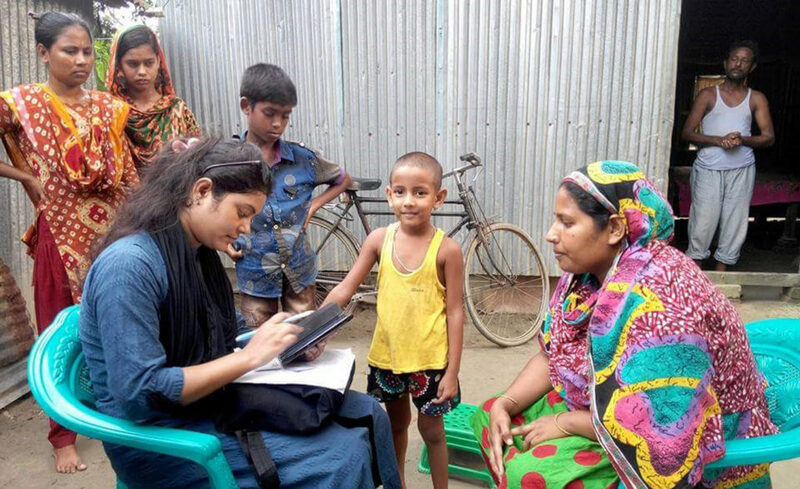 The enumerators will begin the work of recording their observations in a tablet using a digital questionnaire at the two sites of Islampur (Jamalpur district) and Lalmonirhat (Lalmonirhat district). They will also record anthropometric data on height, weight, mid-upper arm circumference (MUAC) measurements and hemoglobin levels using a non-invasive device called the ‘Pulse CO-Oxymeter’. The tablet-based surveys are part of a 6 month pilot study on using peanut based food supplements for nutritional interventions among school children at the two locations. Using a structured baseline and endline study, they are designed to include data on the socio-economic status of beneficiaries’ households in addition to dietary diversity at the household level. The baseline surveys, which will be completed in October 2017 in both locations, will cover 500 primary school children (between 5-10 years of age) and their respective households. During his visit to ICRISAT, Mr Hamzaoui also saw the latest research on groundnut breeding being conducted by ICRISAT’s Crop Improvement theme and Center for Excellence in Genomics. Presented with prototypes of groundnut-based food supplements developed by the NutriPlus Knowledge Program at the Agri-business and Innovation Platform, ICRISAT, he noted that private sector partnerships were a key strategy for up-scaling development efforts, and were essential for the success of the project. The food supplements demonstrated included groundnut bars (30% peanut) that provides approximately 429 kcal of energy/100 g; nutri-cookies (26% peanut) with about 445.08 kcal of energy/100 g and a groundnut spread (36% peanut) with approximately 495.3 kcal of energy/100 g.
The groundnut bar and nutri-cookies were shortlisted for use in the pilot study based on an acceptability study conducted among the school children in Belgasha Government Primary School, Jamalpur district, Bangladesh. As the project involves technology transfer to PRAN Agro industries (PRAN) in Dhaka, Bangladesh, for local production and the supply of food supplements, Dr Mazumdar and Dr Manjurul (BARI) visited the PRAN facility in Habiganj Industrial Park, Bangladesh, and discussed the modalities of technology transfer, and production and supply of the peanut-based food supplements. The supply will begin following the completion of the baseline survey. Project partners: Bangladesh Agricultural Research Institute (BARI), PRAN Agro Industries (PRAN)- Dhaka, Christy Friedgram Industries (CFI)-Tamil Nadu, ICRISAT and local NGOs based in Bangladesh. “We prefer those millet varieties that, when cooked, can be stored overnight without losing color and taste and that can be served as breakfast the following morning,” states Delu Shugaba, a farmer from Minjibir in Kano State of Nigeria, on traits he prefers in pearl millet. Delu is part of a group of 60 farmers (20 men and 40 women) who took part in a farmer participatory millet variety and traits selection exercise in Minjibir on 13 September 2017. 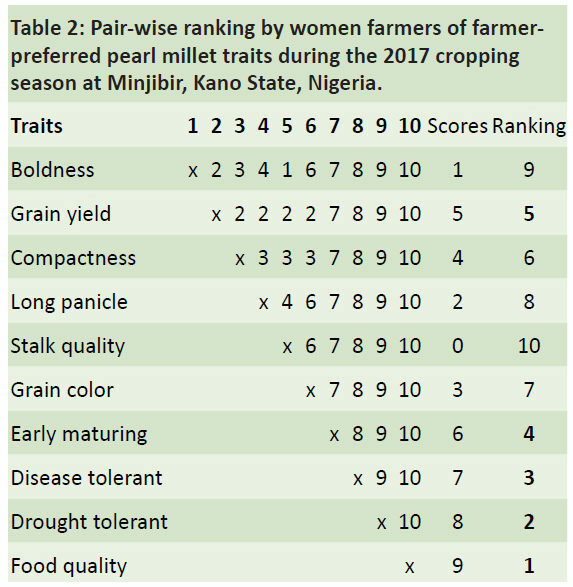 The selection involved a pair-wise ranking of pearl millet traits to determine which farmers most preferred as a criterion for effective selection. Independent of each other, men and women’s groups listed 8 and 10 most important traits, respectively. 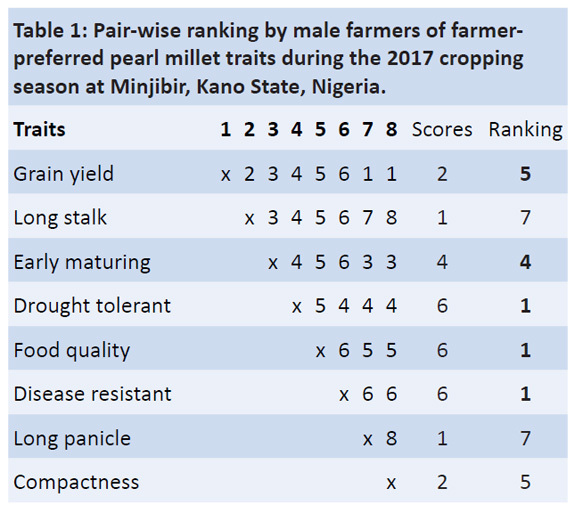 The result of pair-wise ranking for men farmers (Table 1) showed that drought tolerance, food quality and disease resistance (downy mildew) have equal status in their list of preferences, followed by early maturity and grain yield. Among women (Table 2), food quality, drought tolerance, disease resistance, early maturity and grain yield were ranked 1-5. Both genders ranked early maturity and grain yield in the fourth and fifth places, respectively. A parallel discussion with the participants on why food quality and production constraints (drought and disease) are important reveals their preference for varieties that can recover from mid-season drought spells commonly experienced in July. The rainfall pattern in this area has been erratic, with mid-season drought, early season and disease pressure on pearl millet. The exercise suggested that in addition to yields that have traditionally dominated policy discussions, crop breeders should incorporate food quality, taste and traditional knowledge in their breeding programs in order to facilitate adoption and fast-track commercialization of released varieties. Participants also assisted in the participatory selection of 30 varieties in a regional trial. Their contributions will help in the evaluation of varieties, as well as influence selection of traits in millet breeding programs in the future. 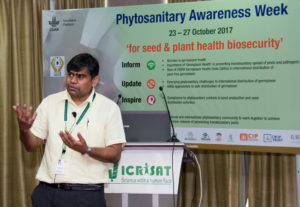 A one-day workshop on ‘Marketing strategies for biofortified crops’ was organized at ICRISAT by project partner HarvestPlus India on 15 September 2017 to promote the adoption of nutrition-rich pearl millet cultivars by farmers in India. Participants, including representatives of eight seed companies, shared experiences from the field and discussed strategies for scaling up demand for biofortified crops. Mr Binu Cherian, Country Manager, HarvestPlus, shared the status of global biofortification efforts, underlining the progress made in crop development, nutrition research, and delivery efforts. He highlighted HarvestPlus’ commitment to enhance efforts to develop biofortified cultivars of several important crops with the aim of reaching 1 billion malnourished people in Asia and Africa by 2030. He underlined the need for the private and public sectors to proactively partner to support the development of proven technologies to farmers. Dr M Govindaraj, Senior Scientist, pearl millet breeding, ICRISAT, in his presentation on the performance of biofortified pearl millet cultivars and the latest National Family health survey data, ascribed the prevalence of anemia and stunting to declining per capita consumption of millet (<4 kg) and increased consumption of processed fine cereals and junk foods. He also presented evidence to prove no negative linkage between grain yields and biofortification. Stakeholders also discussed the positive outcome of the national cultivar release policy on product development, which, for the first time, includes parameters for minimum levels of micronutrients in staple crops. Further, they stressed the need to work closely with the Ministry of Agriculture and Farmers’ Welfare, Government of India, for the promotion of biofortified crops through seed markets and to incentivize biofortified grains with premium prices during the initial years in order to encourage farmers and seed companies to invest in product development. Partners also requested that ICRISAT provide them with data on the yield potential of seed parents for quick delivery of pipeline hybrids and asked scientists to share superior high-iron hybrids and parental lines in advance for test marketing. They visited biofortified pearl millet demonstration fields and selected advanced hybrids for up scaling in 2018. The meeting concluded with discussions on product test marketing and creating consumer demand. There is also a need to work with diverse partners for policy support and to leverage existing value chains to develop sustainable markets for biofortified crops. Involving seed companies in groundnut seed production and marketing which is crucial to enhance the groundnut value chain is the key focus of the Tropical Legumes III project in Tanzania. With this in mind, a meeting was organized on 7-8 September 2017 with stakeholders to discuss key steps to be taken to expand the groundnut seed business to facilitate collaborations for improved seeds. The 22 participants present were drawn from private seed companies (Beula Seed. Co, Suba-Agro, Temnar Co. Ltd, MERU AGRO), the public Agricultural Seed Agency (ASA), NGOs (Care International, One Acre Fund), Africa Rising, Agricultural Research Institute (ARI)-Naliendele, ICRISAT Nairobi and Malawi, The International Centre for Tropical Agriculture (CIAT), Arusha, and the TL III groundnut focal point in Uganda. The meeting provided an opportunity to assess the collaboration between ARI-Naliendele and ASA and reach new agreements for improved seed production for the 2017-2018 season. The seed companies committed to participate in awareness and demand creation activities, and expressed interest in small bulking of the new varieties promoted under TL III. Dr Esther Njuguna, Scientist, Gender Research, ICRISAT, spoke of gender expectations from the project and on interventions that would help close the gender inequality in seed production and ensure greater participation of women in the decision-making process. Agrochemicals (pesticides and fertilizers) are widely used in northern Nigeria to enhance groundnut production and productivity, right from storage to marketing and distribution of grain, and in seed dressing before planting. Using eco-friendly options such as groundnut haulms to enhance soil fertility are limited as these are used for livestock feed, especially in the dry season between February and June. Further, using droppings from large ruminants encourages rapid growth of weeds and other pests, adding to labor inputs required for farming. As part of the USAID-funded project on ‘Increasing groundnut productivity of smallholder farmers in Ghana, Mali and Nigeria’, a training workshop was conducted for extension agents and field assistants to create awareness on the detrimental effects of using pesticides and fertilizers. The aim was to provide them the basic skills and knowledge to advise farmers on steps to take to minimize the negative impacts of such use on the environment, natural ecosystems and human health. The workshop brought together 91 extension agents (including 8 women), with 64 of them from project implementation partners of the Agricultural Development Programs, 6 from private seed companies and 21 from partner institutions. Most sessions were conducted in the Hausa language by resource persons from ICRISAT Nigeria. An introductory session on the potential of groundnut nitrogen fixation turned into a discussion for sharing experiences on the soil amendment potential of the crop. Participants were made aware of the health hazards of the inappropriate use of these pesticides, which range from mild (nausea, poisoning, etc.) to fatal; pesticides can prove extremely harmful to women and children who are increasingly involved in many farm activities that bring them into contact with the chemicals. Participants also recognized that indiscriminate use of pesticides and fertilizers can harm beneficial soil micro-organisms leading to reduced nutrient concentration in the soil, weaken root systems of crops, and increase water and wind erosion. The workshop also delved into specific aspects of groundnut-based technologies, from production and storage to distribution of quality seeds and emerging trends and challenges of producing groundnut in the dry season. Partners: Institute for Agricultural Research (IAR), Nigeria; Nigerian Agricultural Seed Council (NASC); Centre for Dryland Agriculture of the Bayero University of Kano (CDA/BUK); Federal University of Agriculture- Makurdi (FUAM); Green Sahel Agricultural and Rural Development Initiative (GSARDI); Catholic Relief Services (CRS); Women Farmers Advancement Network (WOFAN) and the Agricultural and Rural Development Authorities of Kebbi, Sokoto, Kano, Jigawa and Katsina, Nigeria, and ICRISAT. As part of ICRISAT’s effort to enhance the capacity of various actors along the sorghum value chain and enhance the capacity of small- and medium-scale agricultural equipment fabricators in Nigeria, a 5-day training workshop was organized recently by the Federal Government of Nigeria and the Food and Agriculture Organization (FAO) in collaboration with the National Center for Agricultural Mechanization (NCAM). 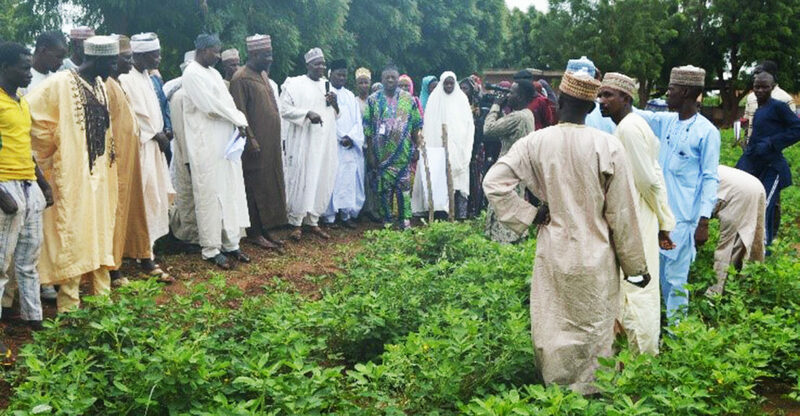 As part of the Agricultural Transformation Agenda Support Program Phase One (ATASP-1), 34 beneficiaries were selected from agro-machinery fabricators across 6 selected states: Kano, Jigawa, Kebbi, Sokoto, Niger and Yobe. Participants were trained in workshop safety, maintenance/repairs of agro-processing machines, identification and fabrication of critical parts of planting operation machine (planters), identification and fabrication of critical parts of post-harvest processing equipment (milling/winnowing machines) and safe storage of agricultural produce. Glad to be part of the training, Okereke Chukwumarije, a fabricator from Agaie LGA Niger State said, “This training has opened our eyes to the intricacies and techniques of selecting materials for fabrication of critical components of processing machines and planters”. Dr M Y Kasali, Executive Director, NCAM, stressed on the need for partnerships to create linkages across agricultural value chains to ensure development goals. Partners: IITA (lead) (cassava), Africa Rice (rice), ICRISAT (sorghum), National Agricultural Research System (NARS) in Nigeria, women and youth groups and the private sector. Dr Jagdish Jaba, Scientist-Entymology, ICRISAT, was awarded a Special Mention Certificate in the Young Scientist category at the EET CRS 5th Academic Achievements Awards (2017). 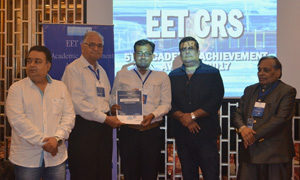 The award ceremony was organized by Education Expo TV on 10 September 2017 in Mumbai. International Centre for development oriented Research in Agriculture (ICRA) has announced three new courses on agricultural education and outreach, research and agribusiness for the period of March – June 2018. The courses are for professionals in agricultural value chains and for educators working with smallholder farmers. Find more information on all their upcoming courses here. Dr Anthony Whitbread, Research Program Director – Innovation Systems for the Drylands, has been selected as a member of the new Executive Committee of the Agricultural Model Intercomparison and Improvement Program (AgMIP). This nomination to the Executive Committee reflects the growing interest in, and impact of, scientific contributions of the AgMIP community through its global network of researchers. Members of the Executive Committee are internationally recognized leaders for their sustained scientific and technical contributions to agricultural sciences, and they will play a major role in developing the AgMIP scientific pillars, partnerships, protocols, and projects, with active participation of AgMIP researchers and sponsors. We regret to announce the passing away of Mr Emmanuel Mkuwamba, scientific support staff based at Chitedze, Malawi on 24 October 2017, due to complications arising from high blood pressure and diabetes. Emmanuel was instrumental in keeping alive the breeding pipeline for ESA’s groundnut breeding program and, along with Dr E Monyo, in rebuilding the program to provide germplasm to the whole region. In recent years, he also handled on-station and on-farm research activities because of his excellent skills in data collection and analysis. He will be deeply missed. Our condolences to Emmanuel’s family and colleagues for their loss. Protease inhibitors of Cajanus conferring resistance to pod borer of pigeonpea (Cajanus cajan L. Millsp). Food Insecurity and Forced Displacement of People: Where do we Draw the Line? Can India meet sustainable development goals on poverty, hunger despite sluggish economy?